We had an apprentice beekeeper with us for the hive check on Saturday. 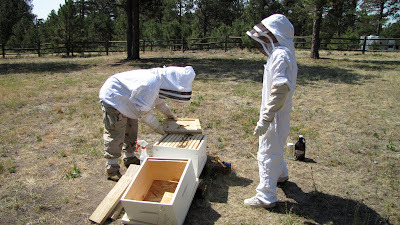 Jason's niece came out with them, they suited her up, and she got her first look at beekeeping close up. Including tasting honey straight from the comb! Hopefully she had fun, learned a little, and will join us again. I forgot the smoker. 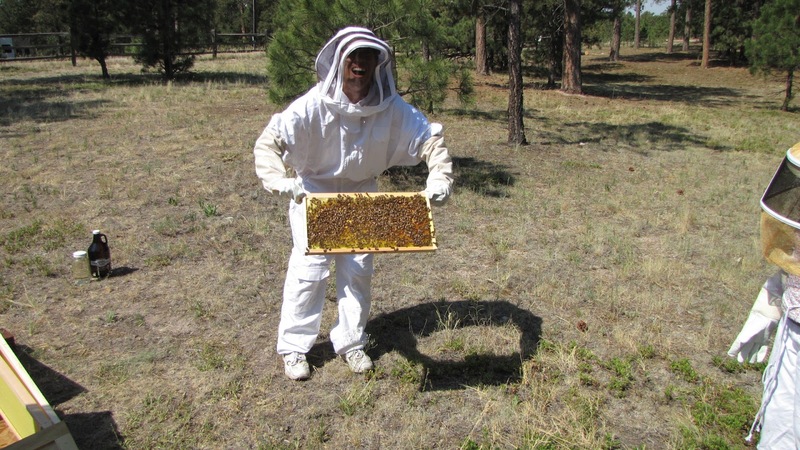 I pull it out of my car and make sure it's safely extinguished after each hive check, and I forgot to put it back in my car for this visit. 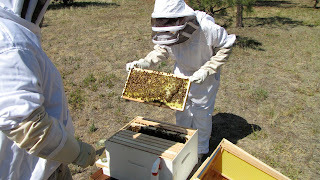 We were slightly concerned, but the bees were calm and we couldn't tell a difference in behaviour between with/without smoke, although without the smoker we couldn't get them to move down into the hive when putting the inner cover on, so we had to slide it across slowly in order to not squish them. Also, we weren't doing anything really disruptive, so need for the smoker was not as great. Maybe we'll try to do more work without smoking them as much, as it sets them back a bit, and we need them to BUILD COMB FASTER! 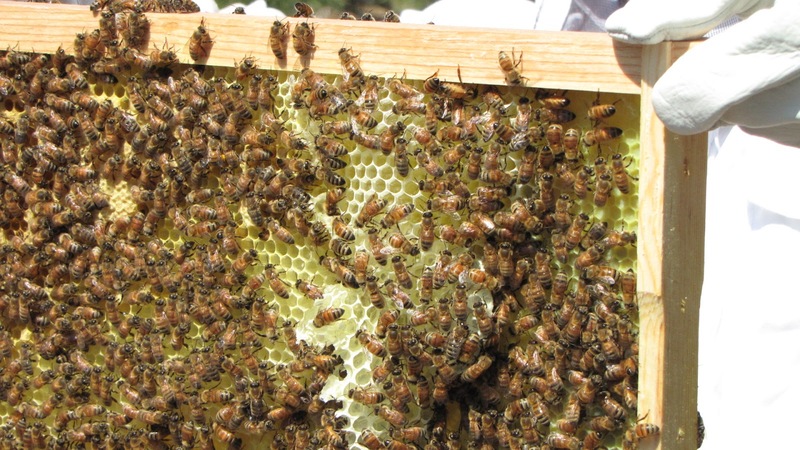 The overall impression during the hive check was slightly increased population of bees, not much new comb, and not a lot of empty comb for the queen to lay in. 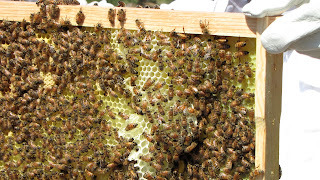 It's good that she's filled the available comb, but most of it was capped brood, which means she has to wait for bees to hatch or new comb to be built for her to have more room to lay. There's also no room for significant honey stores to be added, which means slow buildup for winter. Not that we've had much moisture around here, but if there was a good nectar flow, they wouldn't be ready for it. Is it the bees or the foundation? Sarah says Frame #4 was HEAVY! What's up with the double-layer comb? Sarah and I talked, and I'm going to make a few foundationless frames and replace some of the empty plasticell frames with them. 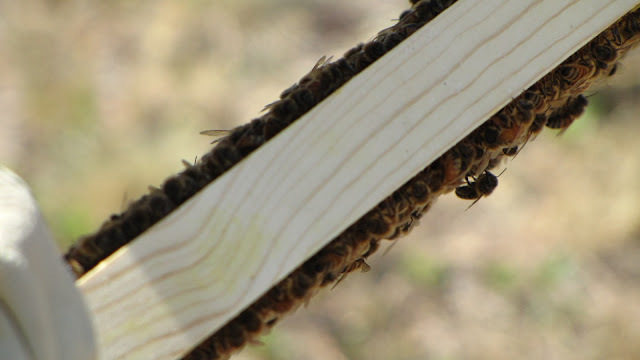 I'd like to see if they will build up comb faster that way, or if they're just slow builders due to the dry conditions (even with feeding sugar syrup). 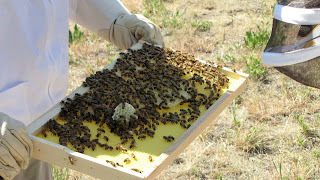 Sarah's pretty much letting me run with decisions on this hive, and next year hive #2 will be her opportunity for CEO. 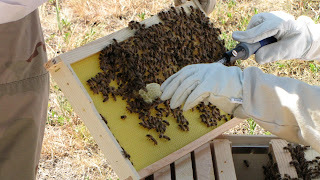 That means the Mistakes, I mean the Choices, for hive #1 are mostly mine to make. We're both learning so much through the process, and with no single right way to do things there's lots of decisions to make. In addition to swapping out a few frames, I'm going to set up a 5 gallon open feeder. 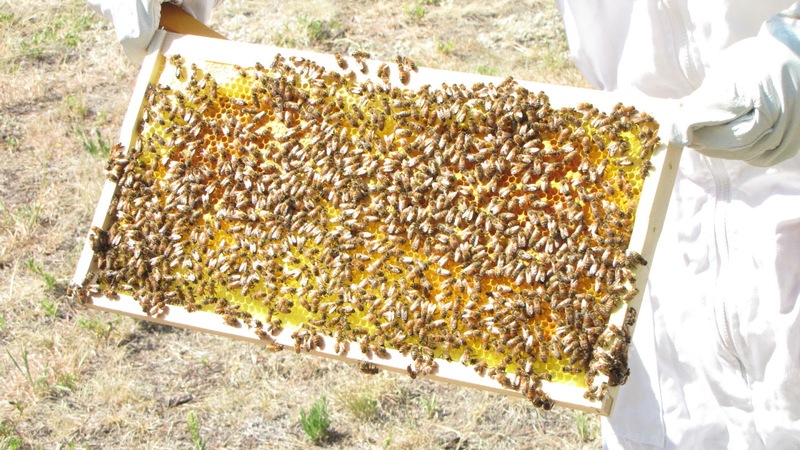 Open feeding is where you provide a food source (sugar syrup) with no physical restrictions on access to it. The entrance and top feeder we're using now must be accessed from inside the hive, which means other insects (hornets, wasps, ants, other bees) must get past the guard bees first. 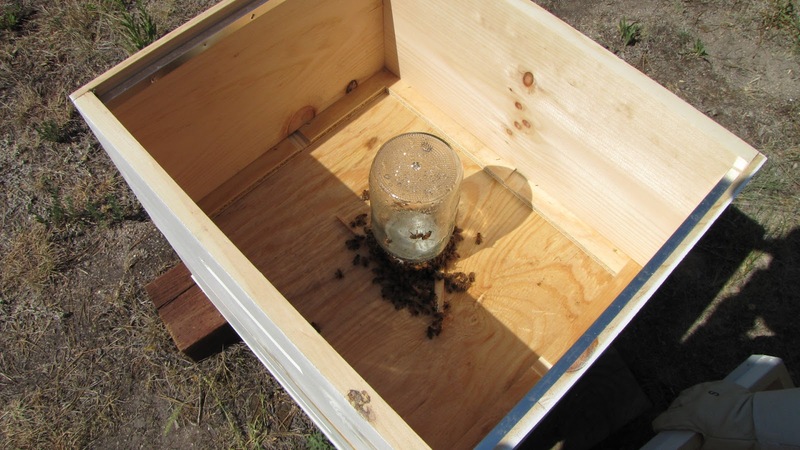 The open feeder could attract these other insects, but it could also allow more bees to feed at a time, and need refilled less frequently. 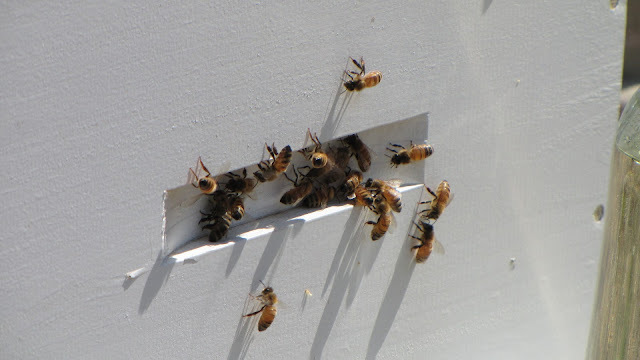 In order to discourage robbing (where these unwanted insects might follow my bees back to their hive and steal the nectar/honey they've already collected) open feeders should not be placed too close to the hive. I picked up a food-grade plastic bucket with lid from a local donut shop, now I just need to drill the holes, mix the sugar syrup, and install in the bee yard. No problem.